For the month of January, we decided we wanted to help out the Kempe Foundation. For those of you that are not familiar with the organization it helps with the prevention and treatment of child abuse & neglect. The Kempe foundation helps children in many different ways. They give every child a brand new teddy bear. So they are always in need of teddy bears. 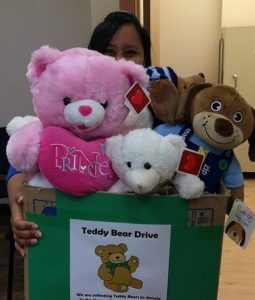 We wanted to help them out and so we asked for donations from our employees & patients and as a result we collected 22 new teddy bears in one week. We are very appreciative of everyone’s support in helping us help children of child abuse and neglect.